When I was about eight, I realized that if I were going to the make the most of all the Saturday morning shows and cartoons that the new television season would bring, I would have to get organized. I took the newspaper TV listings, a pad and pencil, and sat down to make the most efficient viewing schedule I could. It took several drafts (each of them offering a new opportunity to dislike the look of my own handwriting), but I finally came up with a system for managing Saturday morning TV time. At this same age I already had a penchant for notebooks, but because of the handwriting problem, I couldn’t bear to sully my lovely notebooks—hardbound blank books, not ordinary spiral or composition notebooks like I used at school—by actually writing in them. In ninth grade my handwriting developed into something that looked as good as what was in my head, and sometime around 10th grade I began keeping a dated diary/journal/writer’s notebook—using some of those blanks books I had saved. 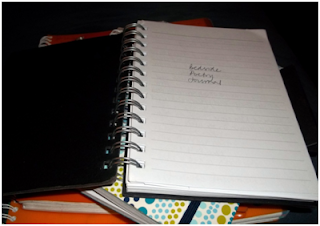 Both these stories tell something about my current notebook practices. 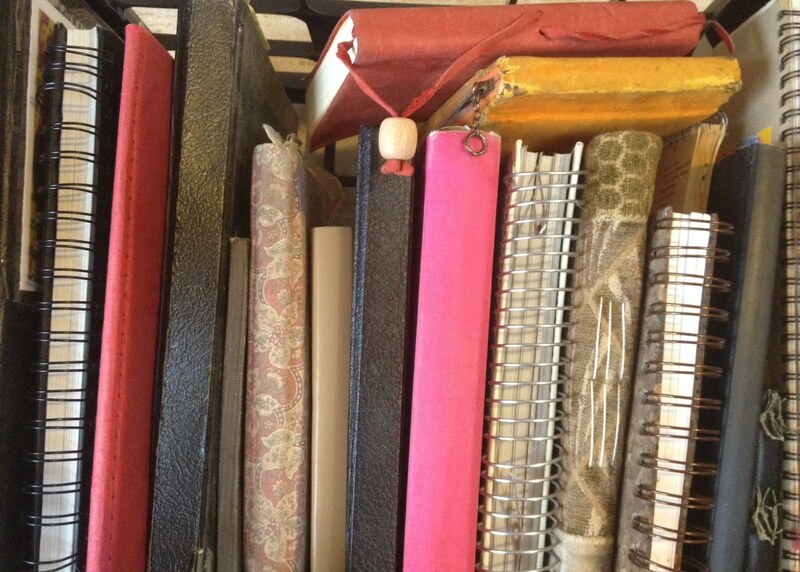 “Time Existing and Available” continues to be my organizing principle in life, and trawling through the riches that other writers and artists have shared here I find that my way of using notebooks—which I thought was extremely common—is perhaps less common than I thought. Instead of piles and stacks of various pads and pages and notebooks and napkins and walls and ticket stubs, I have a long series of notebooks which are essentially journals that proceed in linear chronological fashion from 1979 onward (and which include frequent attempts at scheduling and timetabling and controlling every aspect of life; I never learn). 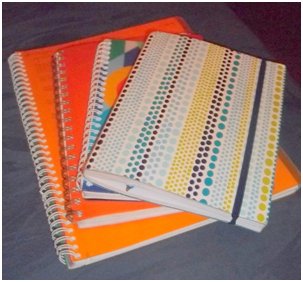 Here’s my current dotty-spotty notebook, on top of a stack of notebooks dating from 2001. Since I started writing poetry in earnest in 1999, my pattern has been to draft once, twice, maybe three times in my notebook and then move the poem to a document for tweaking and formatting, for shaping. I also keep a little “Bedside Poetry Journal” in case of late-night or early-morning strikes of inspiration. …my laptop. Because I use it for so many daily tasks, over the last couple of years it has increasingly and imperiously usurped the role of my notebook. By November 2011, when I decided to try writing a poem a day, only the first two, disrespectfully crammed on a single page, appeared in the dotty-spotty notebook. I wrote all the rest on the computer, in Word. It worked, but I really believe there is a different quality and a different pace to writing by hand, and of course it’s very hard to record the real process of revision if you’re editing a document rather than working over a page in your notebook with a pen. So when Amy invited me to share my notebook, I vowed to return to drafting-by-hand, and it feels good! Here are samples of notebook drafts that eventually graduated to computer documents for final tweaking and publication. 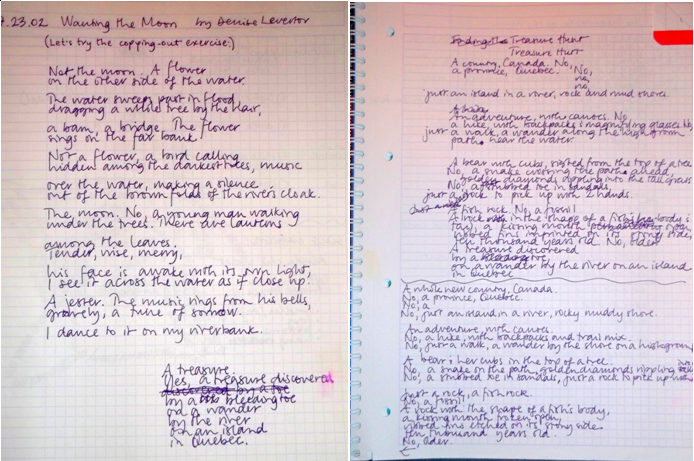 On the left, 7.23.02, you can see a Denise Levertov poem that really piqued my interested in “No-Poems,” poems which assert and then argue with themselves. On the right and below are the first and then immediate second drafts of “What I Wanted and What I Got” from Squeeze (2005). See how the form, the voice, the whole idea is wobbly the first time around, but under that squiggly line, it starts to firm up? Next, from May 2006, you can see that I do occasionally find myself without a notebook. These are the first and immediate second drafts of “Shell Game,” from Pumpkin Butterfly (2009). 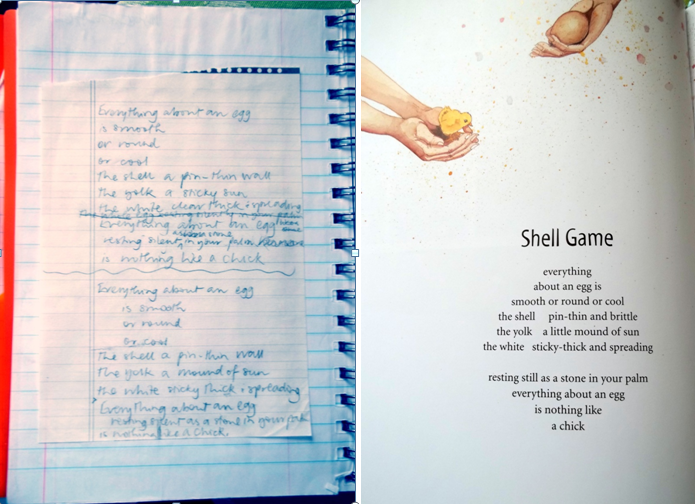 I wrote these on a pad sitting in my car outside a school where I knew I would be doing several poetry visits, including one to a class that was incubating chicks. It wasn’t until I got the draft typed up that I saw it would be possible to make it egg-shaped! Once again, though, you can see me finding my way through the poem in the first draft, and coming almost to the final version in the second draft. 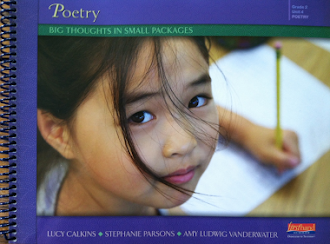 Being a classroom teacher, I have both a poetry challenge and a poetry prize suitable for classroom application! Students, I know that the first draft of any piece of writing is a lot of work, and when you’re done, it’s hard to imagine writing it all over again. But an immediate second draft works well for me almost every time, so I encourage you to try it too. 1) Write the first draft of your poem on the LEFT side of your notebook or paper. 2) Read it out loud to yourself or a friend. 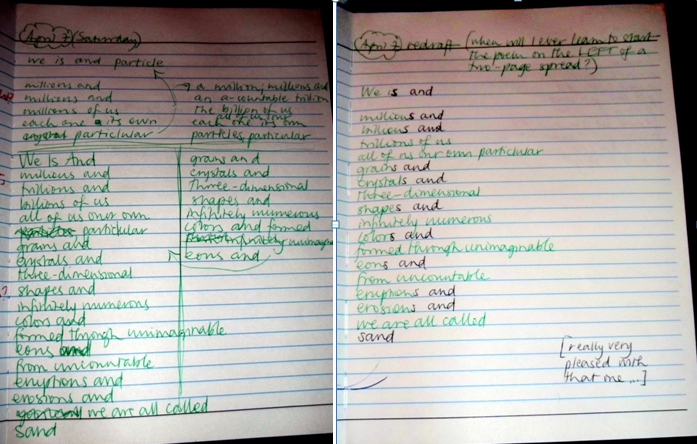 4) As you write, let the poem show and tell you what might work better…a new arrangement? a better word here? take out a word there? Maybe you won’t find anything to change, but maybe you will. By the end of the first draft, the poem is telling you what it wants to be; writing the second draft right away is your chance to show the poem that you’re listening! For a teacher who comments here, I have an unbound copy of PUMPKIN BUTTERFLY which I’ll take apart, laminate, and mail to you at school for use as a collection of two-sided poetry posters in your classroom. Let me know if you want each poem signed as well. The drawing will take place this Sunday evening, May 6, and the winner will be announced on Monday, May 7. 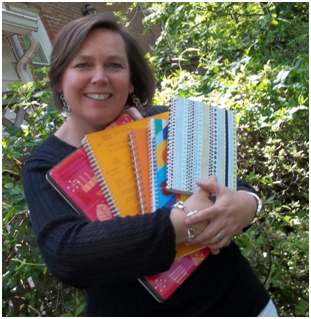 Thanks to Amy for inviting me to share my notebooks, and happy double-drafting-by-hand to all! Heidi Mordhorst is a kindergarten teacher and poet who practices her arts in Montgomery County, MD just outside Washington, D.C. Find out more about her books and other publications by visiting her blog at http://myjuicylittleuniverse.blogspot.com or her website at www.heidimordhorst.com. THE WINNER OF ALLAN WOLF'S ZANE'S TRACE IS MICHELE KRUEGER! PLEASE SEND ME YOUR SNAIL MAIL ADDRESS TO AMY AT AMY LV DOT COM! Saturday morning television viewing was a very serious science. I hope you also viewed the "new Saturday line-up" specials, as I did, in order to make informed decisions. 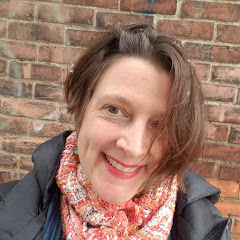 The more blogs, books and articles that feature Heidi Mordhorst the more enriched we ALL are because her writing (at least to me) is a melding of e.e. cummings and Emily Dickinson. Consider her their spiritual cousin. Love her writing, love her vibe. Wow! Heidi you are an inspiration, thanks for sharing. 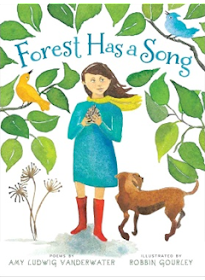 "By the end of the first draft, the poem is telling you what it wants to be; writing the second draft right away is your chance to show the poem that you’re listening!" I believe that most have slightly different ways of notebook use, but you seem quite methodical, so what you did makes sense. Love the idea of all of us being sand, grains and crystals and three-dimensional shapes. The idea of left side/right side is good. 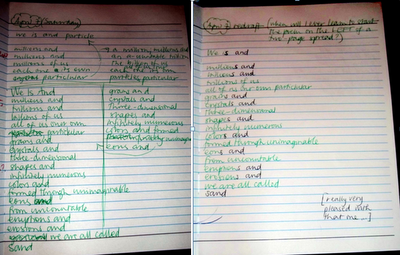 I mostly have had students use top & bottom of one page, but your idea gives more room. Thanks, Heidi! My fingers are crossed that I'll win the drawing!! Heidi this is awesome! Thanks for sharing your "other life" with the school community! I look forward to sharing your books with my class! I can't wait to show my students this blog today! One of the biggest challenges is showing them that writing is a process but it is such a fun process. I love that you have walked us through your life as a writer - I, too, saw a bit of my own life through your writing. Thank you, Heidi! Fantastic! I just loved the kindergarten poems from your blog last week. They were precious! I admire your passion! What a thoughtful post this is...and so inspiring. I am going to try your notebook idea for first and second drafts for myself. It might actually push me to keep a promise to myself for more writing....here's hoping!! I notice you enjoy making your words more fun with green ink. 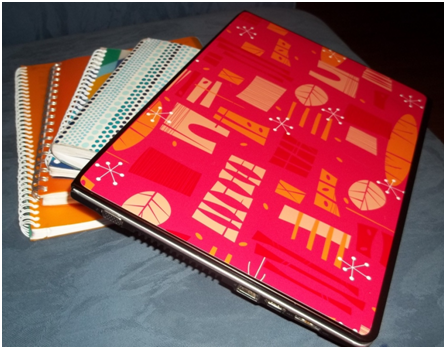 Did you give yourself a new notebook when you went to the workshop at Highlights? Thanks for sharing your journals, it was interesting to see how you make your magic. I love your entire post. I have a bit of an addiction with journals. I love your bedside poetry journal. Great idea for those middle of the night inspirations. Thanks for sharing! If I won, I would for sure want the poems signed. My students have their fingers crossed for me.